Individual Volumes of this set available by request. Call. The Body of Christ has fallen under a horrible epidemic where believers in God no longer believe in God! Believe it or not, we now have Churches full of people who are living like practical atheists. Oh, we say we believe in God, but most of the time we act like He’s not there with our lips as well as our lives. This is not only detrimental in our walk with God; it keeps others from believing in God. Therefore, to avoid this irony, this study, The Character of God seeks to equip you with an intimate knowledge of God from the Word of God, the Bible. 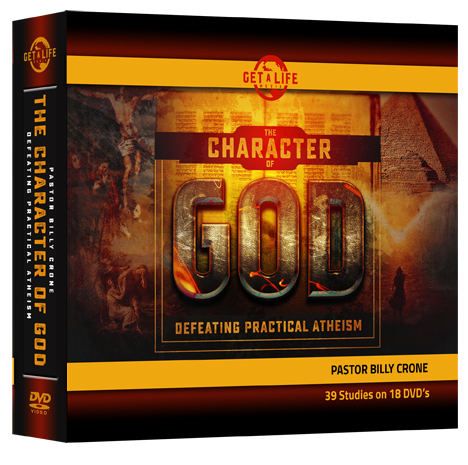 In it you will journey through an in-depth and fun study on the Character of God. The good news is that we really can have a personal intimate relationship with the Creator of the universe. But if the world is ever going to believe our message, then you and I must stop acting like practical atheists and start demonstrating with our lips as well as our lives just Who God is. IN THIS SET: The Existence of God, The Intimacy of God, The Wisdom of God, The Sovereignty of God, The Power of God, Losing Your First Love, The Holiness of God, The Ten Commandments, Please Don’t Go To Hell, The Love of God and Eternal Security.